So Azul is an abstract strategy where you’re placing tiles to complete rows on your personal player board in order to move it to your finished wall and score points. You score points by counting orthogonal connections to the tile you just place. The game play is simple, you take a color (all of that color) from any factory you choose (these are small circular coasters) and the remainder of the tiles go to the middle of the factory floor (aka your table). Then you place the tiles you just took to your preparation area of your player board. At the end of the round (once all the times available have been taken) you move the right most tile from any completed row in your preparation area to the finished wall on the right side of your player board and score it appropriately. The rules are simple, the game is beautiful, and the replay is fantastic. The components consist of slick plastic tiles of various decorations, a decent quality player board, a nice bag to draw the tiles from, some card board coasters to represent factories, and some small cubes to track your scoring. All the components are of nice quality and visually add to the overall look of you decorating a wall in the Royal Palace of Evora. I highly recommend this game, even if you don’t consider yourself an abstract strategy gamer. I also recently played it with a new gamer, when I asked what type games he likes, he said Uno and Checkers. So naturally I picked Azul as something to introduce him to since it’s anabstract strategy like checkers (yeah it was a long shot since they play nothing alike). Anyway, he LOVEDit and we played about 5 plays in 2 days! It doesn’t matter what the theme is meant to be for Azul – the rules of the game don’t reflect anything that is really happening. It is a beautiful abstract. I don’t just mean the pieces, the gameplay is beautiful, too. In this game, players are taking tiles from little groups of tiles and adding them to their board in rows. The restriction is that all the tiles taken must be the same colour and all the tiles of that colour must be taken. When added to the player’s board, the tiles must be placed in a row and all the tiles in that row must be the same colour. The rows have 1 to 5 spaces – if there’s no room left then the player will be penalised for extra tiles. At the end of the round, all of the full rows will have one of the tiles taken off and added to the main ‘picture’ on the board, a 5×5 grid. Once someone completes a row in the that ‘picture’ then the game ends. It’s these restrictions that make the game so enjoyably brutal. You can see what you need and so can your opponents. They can then make sure that the tiles you want aren’t available leaving you with unwanted tiles that will lose you points. As the round goes on the options become less until you find yourself painted into a corner. But it’s a great feeling because all the players are in the same position. Since Azul plays quickly it never outstays its welcome. In fact, I have sometimes felt surprised that the game ended so quickly! Go get it – it’s lovely and it’s brutal! 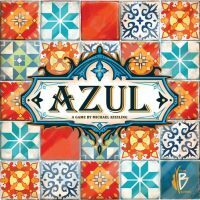 Add a Review for "Azul"